I know I've already showcased a couple of cards made from the Cookie-Cutter Christmas stamp set, but here's another one using the cute reindeer. How clever of Stampin' Up to make it fit the same Cookie Cutter Builder punch by turning it upside down! This card was really simple to make. I stamped three reindeers in black on Crumb Cake cardstock and punched them out with the punch. A Real Red card blank, a panel of crumb cake overlaid with a piece of Candy Cane Lane Designer Series Paper. Two of the reindeers are stuck straight on the card, the middle one is raised up on dimensionals. 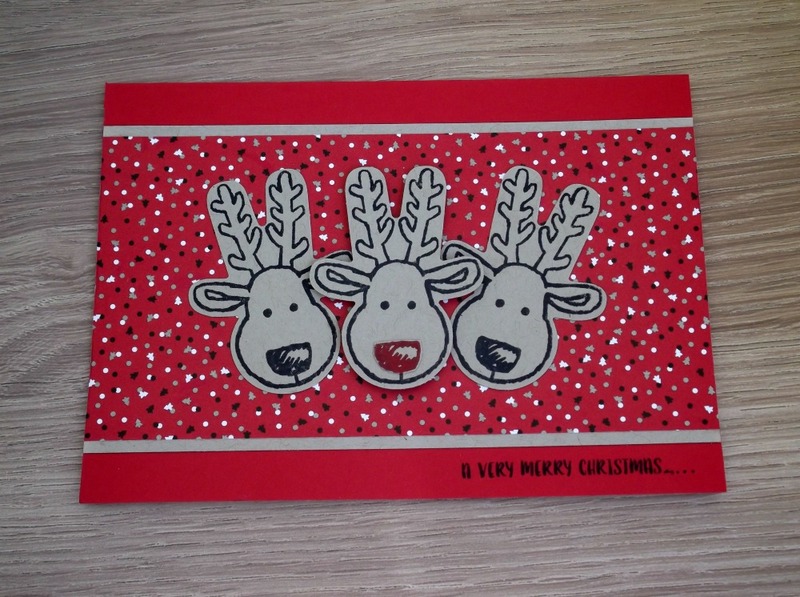 I stamped another reindeer in Real Red and cut round the nose to stick on the middle reindeer. A greeting from the same Cookie Cutter Christmas stamp set stamped in black and there you have it. Please remember that if you would like a copy of our Annual Catalogue and/or the Autumn/Winter supplement I would be very happy to pop one in the post to you ABSOLUTELY FREE OF CHARGE! What are you waiting for? And don't forget the SPECIAL OFFER running at the moment - Buy three packs of Designer Paper and get a pack FREE! !